Stop third parties with Wi-Fi access from changing a Sonos music playlist - PC Buyer Beware! Are you able to set us up another Wi-Fi login password for our Sonos player to use? Idiots are coming into the restaurant and changing the music we have put on, so I need to put a stop to it. I’ve read up on Sonos and they say the best way to do it is to have two separate Wi-Fi login passwords – one for the pub and one for the Sonos to run from. Is that an option? This problem can occur in situations in which a Sonos music system is using a Wi-Fi connection to which several parties have password access. The Sonos Controller app is on the Apple iPod that you use to stream a playlist to your Sonos speakers. The app comes in two forms – one for the Apple devices powered by the iOS operating system – iPhones, iPads and iPods – and the alternative app for the same type of devices powered by the Android mobile operating system. There is no password protection available for the app on either platform, so it’s not possible to prevent people who have the wireless password from changing the playlist by applying a password to the app. Music to the Sonos speakers stream from the Internet using your office ADSL router. Apparently, you can buy a travel router, which would connect to the office router but exist as a separate network that you would use to stream the Sonos app through. It would have its own logon password that you won’t give to people in the restaurant. If the guests want to use the web, you would give them your office router’s password. 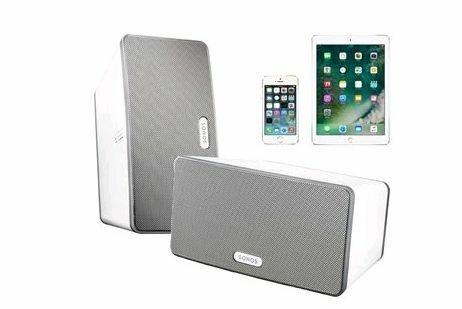 You would just connect the iPod with the Sonos app to the travel router, which would have its own password and it would stream your playlist to the Sonos speakers. The ones with the most reviews and the best buyer ratings are worth looking at. Excellent example – GL.iNet GL-AR300M Mini Travel Router with 2dbi external antenna, Wi-Fi Converter, OpenWrt Pre-installed, Repeater Bridge, 300Mbps High Performance, 128MB Nand flash, 128MB RAM, OpenVPN, Tor Compatible.